Never sat on a horse before or maybe you are looking to improve your current handicap? Whatever your polo playing level, from absolute beginner to experienced international player, Blue Springs Polo School offers a variety of intensive New Zealand polo tuition programs to suit all ages and abilities. Located amidst the lovely rural surrounds of North Canterbury in the South Island of New Zealand, Blue Springs offers superior polo facilities, experienced instructors and exceptional polo ponies for international Gap Year Polo visitors as well as local player tuition. The professional team at Blue Springs Polo School takes great pride in introducing beginners to the exhilarating sport of polo and actively encourages youth players within this popular and fast-growing sport. From short polo induction lessons to personally tailored polo training programs, Mark Donald and his team have a wide selection of sensible and experienced polo ponies to meet your personal polo requirements. Mark Donald organises regular playing tuition for young riders in an enjoyable, fun and safe environment. Mark believes the youth polo courses at Blue Springs is a wonderful opportunity for beginner to more advanced young riders to gain confidence and develop their team building and horsemanship skills. 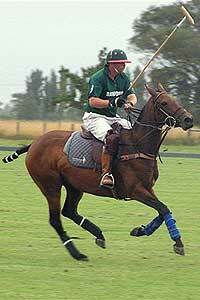 Mark has been playing polo for over 20 years and teaching for 15, therefore he has the skills, experience and empathy to encourage young players in a positive and enjoyable manner. 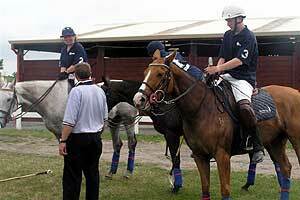 There is always the opportunity to apply fresh techniques and game plans with weekend polo games! During the exciting summer polo season you’ll find Blue Springs polo enthusiast’s at the Christchurch Polo Club each weekend. This is also a great opportunity for polo students to get some ‘hands on’ experience in a competitive playing environment. Blue Springs Polo School offers informative and exciting polo clinics designed to assist all levels of players to improve their game. Beginner clinics are available for children, adults and corporate clients. The clinic will teach you how to ride, hit the ball, ride-off another player and who to hit the ball to! Theory lessons include safety, tack and player equipment. By the end of the clinic you could be riding in a competition game in front of your impressed friends, family and colleagues! Please Contact Us for further information regarding the Blue Springs Polo School.